Le Ruisseau luxury camping site is snugly settled near Biarritz beach; home to the breathtaking Pyrénées and all that the bountiful Basque country has to offer. Beside a wonderful stretch of Atlantic coastline, and being close to the airport, this holiday haven is the perfect choice for families who want to avail of bungalow tent and mobile home luxury. To cast off your dream holiday venture, contact LUX-camp today and we'll set set the ball rolling. What's special about Le Ruisseau luxury camping? Super pool complex with fun water features. Onsite spa with relaxing pampering treats. Very close to lake and beach. Action-packed itinerary of activities for all the family. 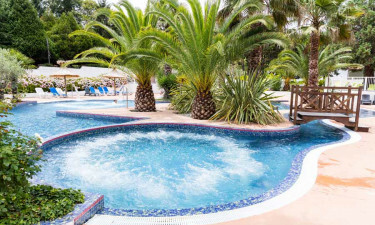 If you can drag yourself away from your luxury bungalow or mobile home, you'll want to immediately check out the site's wonderful pool complex. There'a a large family- friendly lagoon complete with a variety of water slides plus a separate toddler pond for younger ones. Meanwhile, at the Balnéo pool section, there's a large lagoon with a retractable cover. You'll also find a jacuzzi pool with jacuzzi jets, a lazy river feature and seats. Relax afterwards in the sauna and steam room. 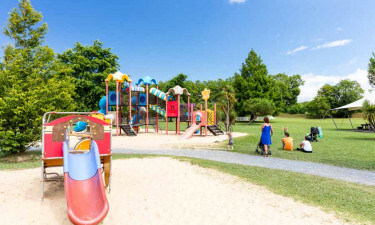 There are five designated playground areas as well as a trampolining spot. The site runs a well organized children's club filled with lots of interesting activities to keep the kids engaged. For adults, there's a multitude of action-packed sports options like table tennis, volley ball, football, basketball and tennis. For those who want to stay in shape, there's a running track which comes complete with an ab machine, cross trainer and a resistance trainer. Le Ruisseau campsite has access to a lake if you want to go fresh-water fishing, cycling or sightseeing. You're also right beside the beach, and close to many towns and villages and other tourist beauty spots. For a great family day out, be sure to drop into La Pinede des Singes, which is certain to keep the kids entertained. Housing over 150 species of monkey who live their carefree lives on the 6 hectares of parkland, this is one memorable location. This tourist attraction offers a guided tour to paying guests and it's a neat way of soaking up some of that lovely countryside. 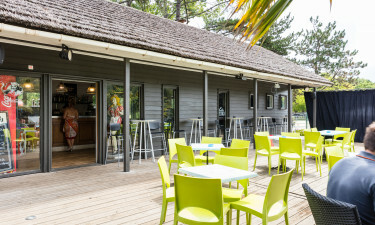 Le Ruisseau campsite has a restaurant onsite where you can eat al fresco style or indoors. What better way to end your evening in one of the two bars, where you can sample some of the tempting local wines. For those who adapt a more laid back approach to cooking, there's a take-away service available. Le Ruisseau camping holiday site has a small grocery store that stocks all your favourite camping essentials. Taste the lovely fresh bread and croissants and don't forget to treat yourself to some luxurious fine French chocolate.